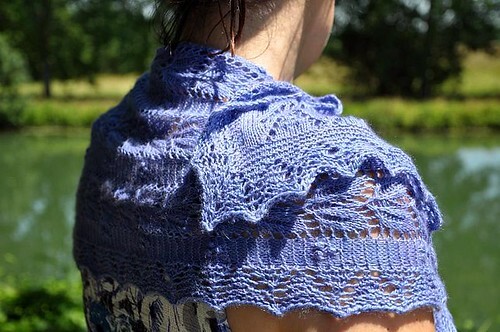 Pattern: Leaf and Nupp shawl, from Knitted Lace of Estonia by Nancy Bush. I chose this pattern because the leaves in the lace pattern also reminded me of bluebells – a nice combination with the yarn, I thought. Yarn: Posh Yarn Eva 2 ply cashmere/silk. This is the Bluebell colourway from Posh’s cashmere club. The colour is hard to capture, especially in the full sun in which these photos were taken. But it is a beautiful, utterly bluebell-y blue, with subtle tinges of lavender. Notes: I spent this weekend at the wonderful Knitnation organised by the awesome Alice and CookieA. I’ll post more on that later, especially with details of my highly uncharacteristic stash acquisition (Wollmeise anyone??). But I also spent a day doing a workshop on Estonian lace making with Nancy Bush. I met some lovely people, and it was incredibly interesting hearing about this region’s history of making lace for the last couple of hundred years. One of the things that I learned was that the nupps, that you can see in the photo above, work best in white yarn, because apparently light reflects differently on white than on any other colour. Which explains why they are not that prominent in my or other coloured versions, and made me think I’d like to try another nupp-based shawl in a natural coloured Shetland laceweight yarn. I also wish I’d made the shawl larger, as it is really more of a large scarf size. Nancy Bush had a sample that she had knitted of the same pattern, in a pure Shetland wool, and it was much larger than my version. I hadn’t thought about it before, but once I saw the two together it was obvious that the silk content in my shawl made the yarn much less stretchier, and therefore block much smaller, than the pure wool shawl. 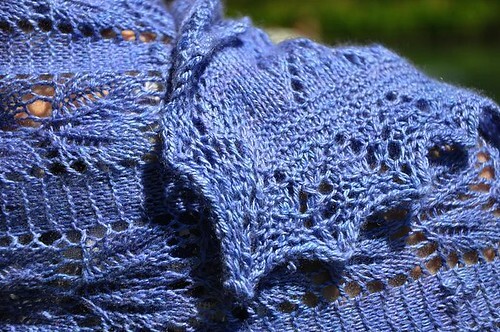 Yet another reason to try a Shetland shawl! Very glam:) Shame we missed each other at Knit Nation, but I’m sure we’ll eventually meet up somewhere! Gorgeous shawl! Love the shot of you in the convertible! Tres chic. Such a pretty color and pattern combination! Beautiful – and love the shot of you in the car! How nice that you got to take a class with Nancy Bush! 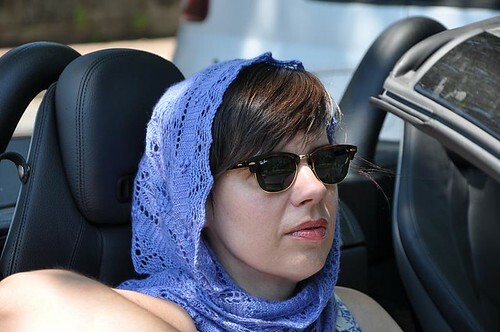 oh yes, a convertable car definitely calls for a stylish scarf and chic sunglasses! how lucky to do a class with Nancy Bush! Not to mention the Wollmeise!! Oh wonderful shawl and love that last photo! love that last photo you poser! I’ve eyed this one off a few times and while I agree entirely that it’s wonderful in that colour, I feel an urge to test the theory of nupps in white now! 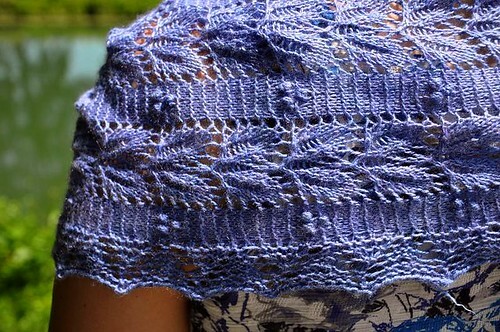 What a beautiful shawl- I just love the color, and the size of it seems perfect! it sounds like you learned quite a bit…can’t wait to see your new stash acquistion. Your shawl turned out beautiful. I am always amazed at how the simple change of yarn can make such a difference. The purple and the silk sheen are wonderful. That shawl is beautiful, doesn’t the colour look great! 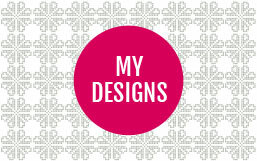 The shawl is stunning and I love the photos – can’t wait to hear more about Knitnation! I took the same Nancy Bush class about 3 years ago. I learned so much!